J. D’souza and Shekar, A. , “Anthropometric measurements as a predictor of metabolic syndrome among young adults aged 18-24 years in Mumbai city”, International Journal of Medicine and Public Health, vol. 5, no. 1, pp. 40-44, 2015. V. Dutta, Lyngdoh, W. Valarie, Bora, I. , Choudhury, B. , Khyriem, A. Bakorlin, and Bhattacharyya, P. , “Characterization of Candida species from Intensive Care Unit Isolates in a Tertiary Care Centre in North-East India: A retrospective study”, International Journal of Medicine and Public Health, vol. 5, no. 4, pp. 312-316, 2015. V. Kishanrao Domple, Doibale, M. K. , Sonkar, V. K. , Aswar, N. R. , Khadilkar, H. A. , and Jain, S. R. , “Treatment compliance of self-reported dog bite cases attending outpatient department of Tertiary Care Hospital, Maharashtra”, International Journal of Medicine and Public Health, vol. 5, no. 4, pp. 297-300, 2015. C. R. Doddihal, Katti, S. M. , and Mallapur, M. D. , “Teenage pregnancy outcomes in a rural area of South India: A prospective study”, International Journal of Medicine and Public Health, vol. 5, no. 3, pp. 222-224, 2015. S. M. Dindod, Makwana, N. R. , and Yadav, S. B. , “Knowledge of caretakers about routine immunization and reasons for partial immunization in rural areas of Jamnagar District”, International Journal of Medicine and Public Health, vol. 4, no. 1, pp. 57-61, 2014. K. J. Desai, Malek, S. S. , Shah, N. I. , Shah, P. K. , Joshi, P. K. , and Dave, J. K. , “Diagnostic Evaluation of Adenosine Deaminase (ADA) Test in the Early Diagnosis of Tuberculous Meningitis”, International Journal of Medicine and Public Health, vol. 1, no. 2, pp. 9-12, 2011. B. Desai and Saxena, D. , “What the Health Sector gains in Financial Budget 2011-12? : At Glance”, International Journal of Medicine and Public Health, vol. 1, no. 2, pp. 73-74, 2011. M. K. Deotale, Ranganathan, U. , Mankeshwar, R. , and Akarte, S. V. , “Study of epidemiological features of health problems in perimenopausal and postmenopausal women in an urban community”, International Journal of Medicine and Public Health, vol. 5, no. 2, pp. 147-151, 2015. A. Deka, Syiem, J. S. , Saikia, S. P. , and Surong, V. , “Participatory Rural Appraisal to Detect Childhood Blindness in Community”, International Journal of Medicine and Public Health, vol. 7, no. 2, pp. 80-82, 2017. R. Kumar Dehury, Samal, J. , Desouza, N. Vaz e, and Dehury, P. , “Status of Women’s Health in Goa and Sikkim: A Comparative Analysis of State Fact Sheets of National Family Health Survey (NFHS)-3 and 4”, International Journal of Medicine and Public Health, vol. 7, no. 4, pp. 196-202, 2017. P. deb, K, S. , Muzaffar, S. , and Qedra, A. , “Molar pregnancy with multiple organ dysfunction, an interesting case report”, International Journal of Medicine and Public Health, vol. 1, no. 1, pp. 51-54, 2011. P. deb, Karamchandani, S. , and Quadra, A. , “Caesarean delivery scar pregnancy [CDSP]: A case report”, International Journal of Medicine and Public Health, vol. 1, no. 4, pp. 50-53, 2011. U. De and Parui, U. , “Primary subcutaneous implantation hydatid cyst”, International Journal of Medicine and Public Health, vol. 4, no. 1, pp. 137-139, 2014. S. Davey and Davey, A. , “Mobile-health technology: Can it Strengthen and improve public health systems of other developing countries as per Indian strategies? 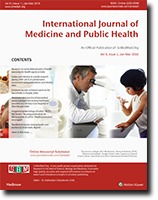 A systematic review of the literature”, International Journal of Medicine and Public Health, vol. 4, no. 1, pp. 40-45, 2014. S. Davey, Davey, A. , Srivastava, A. , and Sharma, P. , “Privatization of medical education in India: A health system dilemma”, International Journal of Medicine and Public Health, vol. 4, no. 1, pp. 17-22, 2014. G. Datta, N, V. , Nayak, S. S. , Bullappa, D. , N, N. , Lakshmikantha, R. , K.S, K. Prasad, and M., A. , “Measuring Empathy Towards Patients among Dental Under Graduate Students of Bangalore City-A Cross Sectional Study”, International Journal of Medicine and Public Health, vol. 6, no. 3, pp. 113-116, 2016. D. Datta, Datta, P. Pratim, and Majumdar, K. Kanti, “Association of quality of life of urban elderly with socio-demographic factors”, International Journal of Medicine and Public Health, vol. 5, no. 4, pp. 274-278, 2015. P. Pratim Datta, Gangopadhyay, N. , and Sengupta, B. , “Association of Psychological Morbidity with Socio-Demographic Characteristics among Elderly: A Cross-Sectional Study from Eastern India”, International Journal of Medicine and Public Health, vol. 3, no. 2, pp. 94-99, 2013. A. S. Datey and Datey, A. S. , “Endobronchial tuberculosis: An unusual presentation of a common disease”, International Journal of Medicine and Public Health, vol. 5, no. 1, pp. 1-5, 2015. B. Dash and Das, R. Ranjan, “Outbreak of Hepatitis B in Sabarkantha District of Gujarat: A Case-Control Study”, International Journal of Medicine and Public Health, vol. 3, no. 2, pp. 119-121, 2013.